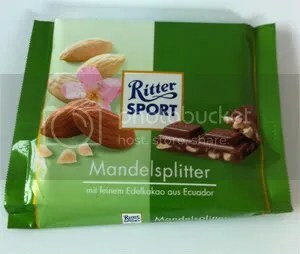 Ritter Sport’s organic chocolate line has caught me indeed. I like the idea of a higher quality cocoa-wise, even though I think the organic part is a little unnecessary. But: There are people (like my granny) who highly believe in this kind of ingredients. Of course, artificial flavors or colors are strictly forbidden, which definitely is a good thing, but here in Germany, non-organic products do have a high production and test standard. But you can tell the difference between the common and the organic product. Not only production-wise (the testing is way stricter! ), but also taste-wise. The almond nib chocolate contains a nice amount of 35% of cocoa that provides an amazingly smelling aroma in connection with the almonds. The clicking noise is rather firm for a milk chocolate, but as you know, there are almond nibs of every size in it. 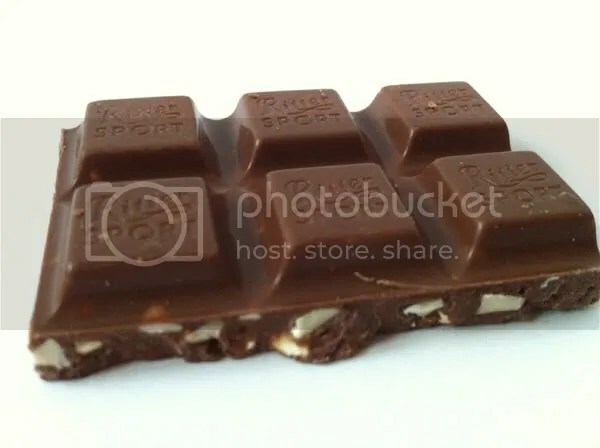 They put in some bite, while the chocolate is soft and smooth and tends to melt very soon. There is a nice sweetness coming with the melting process; and when you chew on the almond nibs at the same time, you have a good amount of cocoa, a nice milky-sweet flavor combined with those nutty and juicy almonds. After I was a little disappointed with the other organic chocolate treats, this one is my favorite so far! It is really good and even better than the common almond nibs miniature I’ve already written about.